Vestax has covered all bases here and the result is a well-built, comprehensive and fun controller. Immaculately built. Filter control on every channel. USB powered. Heavy and bulky. Some control quirks. The VCM-600 may be big, but Vestax has packed a lot into it. The VCM-600 is a DJ-orientated controller that's designed to integrate particularly well with Ableton Live. With a huge footprint and a hefty weight, the VCM offers six channels, and each of these channels is broken down into six 'sections'. Starting at the top, there's a three-band EQ with knob control and kill options for each band. Next are the standard mute, solo and pan controls per track followed by two send knobs labelled A and B and resonance and frequency knobs for filter control. That type of filter control per channel really puts the VCM in its own league - not only is it incredibly useful to have that kind of filter separation over six tracks, it also makes the controller feel more like a hardware mixer. It's a lot of fun to use. Below that is the section that makes the VCM lean towards Ableton Live users - three buttons labelled CF Assign, Clip and Track. CF Assign allocates each track to A, B or neither side of the crossfader, while the Clip and Track buttons toggle between the waveform and Device panel views in Live. Pressing Track twice collapses the Device panel view completely. "All of the knobs and sliders feel robust and Vestax has done a fantastic job of squeezing in so much channel-specific DJ control." Next are the Transport controls for the channels' clips - play and top buttons - and a 60mm fader completes the layout. All of the knobs and sliders feel robust and Vestax has done a fantastic job of squeezing in so much channel-specific DJ control. The straightforward and clearly-labelled layout makes the VCM instantly useable and there are no double functions or Shift options. When you plug the VCM in, after setting it as a control surface in Live, everything is automatically mapped, but things like the filter and EQ controls only come alive when you drag in their relevant plug-ins to each channel (ie, Auto Filter and EQ Three). The right side of the unit contains the Effects controls, Return track control, Tempo and Master controls as well as the all important crossfader. Return control offers you faders, pans and mutes for two return tracks, while the Tempo section offers nudge buttons, a tempo control slider for drastic BPM changes and a Fine knob, for more subtle drops and rises in tempo. It would be nice if you could set a Min and Max for the Tempo slider - as the VCM is set as a control surface in Live, you can't give individual parameters a scale. Many will never drop to 60BPM or rise to 200BPM in a DJ set and a smaller scale would allow for more accurate changes. It's perfectly useable the way it is, though. 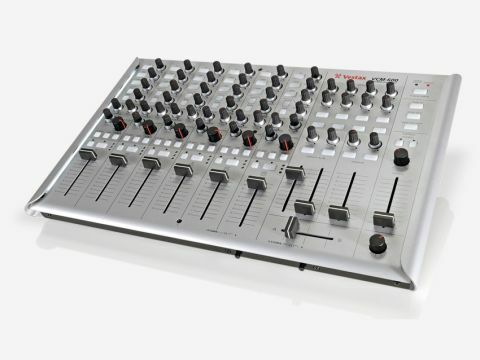 The Master section offers you a velocity fader, cue level and pan knobs, plus two freely assignable buttons. We had one set up as Record and one set up as Stop All Clips and it worked as expected. The crossfader has a nice looseness but feels sturdy and you get the feeling it could take a good hammering over time. To the right of the crossfader is the Scene knob, a pretty unique feature to the VCM and a clever way to approach Ableton's Session View. Scrolling with this indented endless rotary takes you up and down through your Scenes while the Play and Stop controls on each track trigger the highlighted clips. It can take a while to follow where the highlighted Scene is as the knob isn't numbered, but you pick it up quite fast, especially if you delete any Scenes you're not using. Lastly, the top right corner proudly displays a Track Bank button, which expands channel control from one to six to channels seven to 12, giving you double the amount of track control. "It might be a bit heavy and huge to be carried round every night of the week, but as a club install, the VCM-600 is perfect." Other useful features, if you're looking to delve into the 12-track world, are the Pickup and Jump modes, defined at the back of the unit. When in Jump mode, the fader position of the previous channel, for example track one, will automatically change the parameter of its corresponding track in the next bank when the fader is moved, for example channel seven. Pickup mode means that moving the slider won't affect the value of the corresponding track's velocity until it reaches the same position as that channel in Live - the same premise as Absolute and Relative modes. LEDs to the right of the play button indicate whether the value of the fader in Live is less or more than the current fader position on the VCM. Geddit? Below these is the looping section that consists of Loop In, Loop Out and Loop On/Off buttons. On seeing these, we were excited at the idea that this controlled the loop elements of individual Clips, but it actually controls the loop functions of the Arrangement page. This is just an initial assignment though, and you can manually override by assigning Loop On/Off to a specific clip or multiple clips with Shift-click. It's kind of an awkward way to do things, remembering that it's not auto-assigned among other things, but it's yet another workaround in the on-going Live looping saga. Perhaps someone can work out a way to get it working a little better with the new Looper plug-in. The VCM-600 covers plenty of bases: BPM control, effects macros, EQ, sends, returns and Scene navigation in Live. It's rounded off with glowing LEDs, useful side-lighting and bus-powering. It might be a bit heavy and huge to be carried round every night of the week, but as a club install, the VCM-600 is perfect. The lack of an audio interface does make the price a bit more of a sting, but as always with Vestax, the quality of the parts goes a long way to justifying the price - though maybe not enough for some. The VCM-600 is well-built, intuitive and best of all, fun. We really can't stress enough how tight the integration between the hardware and the software is - you really feel like you've got full control. Despite some slightly odd functionality, Vestax has really nailed it with this one. Every laptop DJ needs to try it.